Cheese, chocolate and mountains? All true stereotypes. But if you take a closer look at the alphorn blowing, direct democratic ski resort called Switzerland, you will find a very vibrant exoskeleton scene with many interesting players. In the very dynamic landscape of worldwide exoskeleton research, development and businesses, it is often hard to stay up to date and informed. Often there are hidden activities that are hard to discover if you are not familiar with the local research and start-up communities. Locally oriented (non English) websites and early stage companies without an outreach program can easily be missed. This is why we decided to write an overview about the region that we know from personal experience. 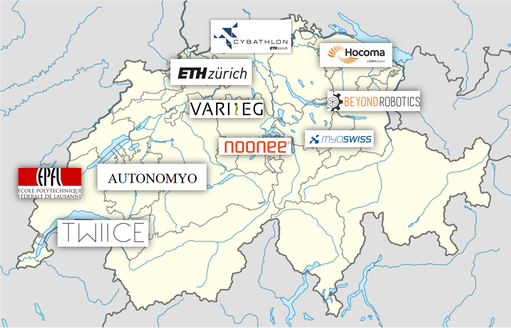 Below we would like to present the exoskeleton players (that we know) in Switzerland and hope this article gives you interesting new insights into our small part of the global exoskeleton landscape. The Lokomat. Picture: Hocoma AG, Switzerland. Let’s start with the dinosaur in the industry. 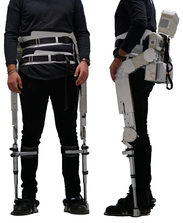 Founded in 1996 and located in Volketswil near Zürich, Hocoma AG introduced one of the first (if not the first) exoskeletons into the market: the Lokomat gait rehabilitation device. Today the company is offering a large variety of rehabilitation devices including the Lokomat and the arm rehabilitation exoskeletons Armeo Power (based on technology developed at ETH Zürich) and Armeo Spring (based on technology developed at the University of California, Irvine). Another pioneering exoskeleton company that early (that is around 2013 in the exoskeleton history books) focused on a passive industrial exoskeleton design and presented the “chairless chair”, a leg exoskeleton that allows its users to sit anywhere to relieve the legs. The chairless chair was designed for workers who have to stand most of the day. Noonee is a Spin-off of the Swiss Federal Institute of Technology in Zürich (ETH Zürich). The Rehabilitation Engineering Lab (Prof. Roger Gassert) at ETH Zürich has several exoskeleton projects in its research portfolio. The team develops exoskeleton technology to explore, assess, and restore human sensorimotor function. This includes the “ETH Knee Perturbator”, a knee exoskeleton that basically makes you stumble and then measures how your body reacts (see video below), the hand exoskeleton “tenoexo” that restores hand function for example in stroke patients, and the gait exoskeleton VariLeg that enables users with paraplegia to walk again. 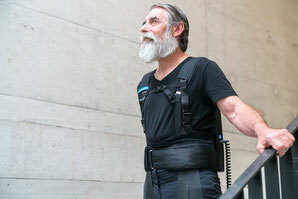 The Sensory Motor Systems Lab (Prof. Robert Riener) is another research lab at ETH Zürich with an exoskeleton program. Among its developments is for example the “ARMin” arm rehabilitation exoskeleton that was eventually commercialized by Hocoma (then named Armeo power), and several research exoskeletons and exosuits. It was also at the Sensory-Motor Systems Lab where the idea for the Cybathlon was born. Teaser of the Myosuit. Picture: MyoSwiss AG. The MyoSwiss AG in Zürich, an ETH Spin-off from the Sensory-Motor Systems Lab, develops a soft lower limb exosuit called the "Myosuit". The suit supports the leg functions of people with muscle weakness in order for them to regain their mobility and independence. For our next entry we will enter the French-speaking part of Switzerland (for anyone who is not familiar with Switzerland: a population of around eight million people thought that it is a good idea to speak four different languages. As a result English is often the common ground, which is of course not one of these languages). Hosted at the Swiss Federal Institute of Technology in Lausanne (EPFL), the TWIICE exoskeleton is a gait restoration exoskeleton that enables users with paraplegia to walk again. It also allows its users to execute difficult tasks such as climbing stairs. 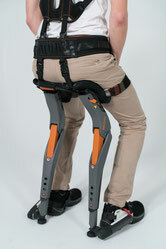 Staying in the French-speaking part and at EPFL, the AUTONOMYO is the third lower limb gait support exoskeleton. 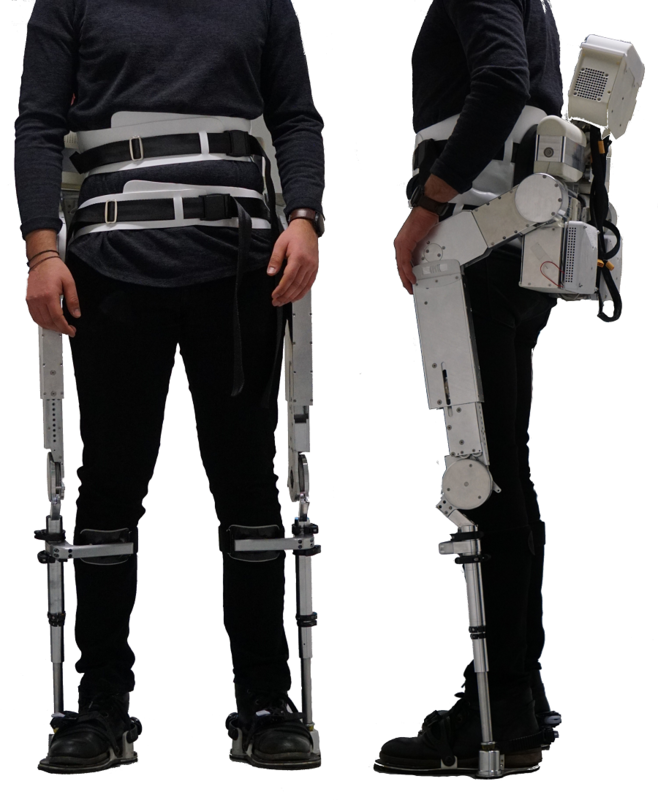 Hosted at the EPFL Laboratory of Robotic Systems, the goal is to provide a gait support system that does not require crutches to keep the user balanced. Target users included for example people with multiple sclerosis. That’s us! Although you might rather be familiar with the name „EduExo“, Beyond Robotics GmbH is our company that manufactures and sells the EduExo kits. Our goal is to make exoskeleton technology more accessible and understandable by providing quality information and learning material together with affordable DIY exoskeleton hardware. 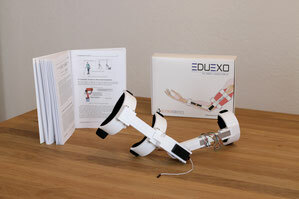 So far, the EduExo kit is our only product. It has been fully released in September 2017 and has been very successfully adopted by private users, schools and universities all around the world. We have many ideas and even prototypes of several extensions and other products. But momentarily we simply do not have enough time, as we all are fully involved in research and other exoskeleton start-ups that pretty sure will soon be included into this list. No article about the Swiss exoskeleton landscape would be complete without mentioning one of the biggest public exoskeleton events today: the Cybathlon exoskeleton race. The Cybathlon is an event organized by ETH Zürich. It has several disciplines that feature athletes with different physical impairments using state of the art assistive technology to race each other in a friendly competition. For the exoskeleton race you will see four identical tracks next to each other in a stadium, eight tasks on each track to solve and a time limit of 10 minutes. Exoskeleton users with paraplegia demonstrated their skills and the newest gait exoskeleton technology during the first event in 2016. The VariLeg and the TWIICE exoskeletons (see above) both participated and achieved the 5th and 4th place in the exoskeleton discipline. The next big event is scheduled for 2020. In between, there are several smaller events that are hosted worldwide and include local exoskeleton races. So take a look at their website and see if there is something planned in your area. So is Switzerland a silicon valley of exoskeleton robotics as some people like to call it for PR reasons? Certainly not. Our winters are way too cold, and we have a severe shortage of oceans and beaches. If you are interested in what is actually going on exoskeleton-wise in the Silicon Valley, you can find a very nice article by our friends at the exoskeleton report. But we can confirm that Switzerland is a nice and exciting place right now to work in the field. With several research labs and an increasing variety of exoskeleton companies and start-ups, we will probably have to update this list rather sooner than later. So if you should end up in this part of the world and have some time, don’t hesitate to write us. Maybe we can meet for a beer and discuss exoskeletons. I am a researcher in exoskeleton field and I have an invitation letter from a professor in ETH Zurich to work on ETH Knee Perturbator. Unfortunately I don't have a financial support to fund me during my stay in Zurich. Do you know how can I find a funding from Switzerland?